Jeffrey Grisamore is President of EGR International, a full-service enterprise engagement agency that provides both strategic and tactical solutions to leading organizations worldwide. When people think of Enterprise Engagement, the first thought for some is that it’s a strategy that requires top management commitment and a structural change in the way branding and behaviors are communicated throughout the organization. Yes, those organizations cited as leaders in this emerging area – McDonald’s, New York Stock Exchange, Best Buy and others highlighted in previous blog postings and on the Enterpriseengagement.org portal – derive the greatest benefits from engagement as a result of top management commitment. That said, the principles of engagement can be applied with success at the tactical level as well. 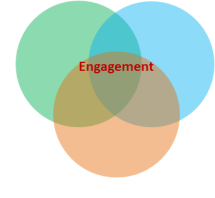 The key element of Enterprise Engagement, whether viewed from a strategic or tactical perspective, is to understand the inter-relationships between an organization’s audiences and also between the engagement tactics used to foster engagement. You can potentially improve the results of any tactical effort – from a training or coaching initiative to any form of communications, rewards, recognition, or assessment tactic – by understanding these inter-relationships and taking them into account in your program planning. For instance, if your responsibility involves engaging a specific vertical audience, such as consumers, channel partners, sales or nonsales employees, vendors or others, it makes sense to take into account how the engagement of any of those audiences, or circumstances involving those audiences, could affect your target. You may not be able to change how the behavior of customers, channel partners, or salespeople can affect the engagement of non-sales employees (or vice-versa), but your engagement effort will probably do better if you take these potential issues into account. Likewise, the tactics of engagement, including leadership, coaching, communications, polls & assessments, rewards & recognition, etc., can almost always be enhanced by integrating them with other key tactics. Simple examples include incorporating rewards & recognition into training programs; emphasizing communications in rewards or recognition programs; adding a communications component to a customer loyalty program; or combining a live event with a social networking strategy. Engagement is merely a better word for integrated marketing, in that the term focuses on the desired goal rather than on the process used to get there. The key to benefiting from engagement, whether at the strategic or tactical level, is to understand that it involves multiple audiences and tactics that inter-relate, and that success comes from understanding those inter-relationships and building them into your organization’s efforts. 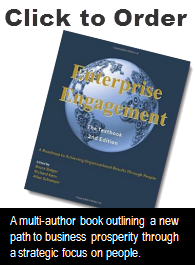 Editors note: Jeff will be speaking at the upcoming 2011 Enterprise Engagement Alliance Networking Conference & Expo, June 1-2 at the Hilton Doubletree Hotel in Tarrytown, NY, on the emerging role of the “engagement agency.” For information, go to http://www.enterpriseengagement.org.